It was our very good fortune to meet Debbie Zardo when we wandered into an Oakville Re/Max office 25 years ago in search for a home to raise our family. A consummate professional, she acted for both buyer and seller when we finally found the house that we loved. Fast forward to 2014. We’ve retired, our sons are grown and we’ve just hung the SOLD sign with Debbie & Rod’s name on our front lawn. Our home sold at 100% of asking price after two days on the market! They bring an in-depth knowledge of the real estate market to the table along with a lifetime of experience buying and selling homes. We enjoyed meeting her son Rod and are delighted that the Zardo tradition of ethics and excellence is undoubtedly continuing. Thank you Rod & Debbie for your phenomenal hard work, dedication and the excellent service you provided to us when selling our home! The way that you quickly organized the interior decorator, staging, and professional photographer and managed the marketing, appointments and negotiations was amazing! Asking Debbie & Rod to be our realtors was the best decision we made when selling our home! They knew right away what was needed and provided specialists quickly to get the house ready to catch the fall market. The results were astonishing- competing offers within 2 days and 107% of the list price. They haven’t just met our expectations but exceeded them by a large margin! 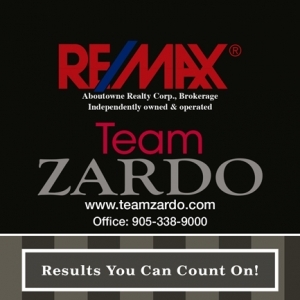 We would like to share the great experience we have enjoyed from having Debbie Zardo as our real estate agent. Our family was transferred recently from Spain to the Oakville area. Debbie quickly understood our expectations and need for a house and demonstrated the right level of patience and perseverance to assist us, identify, and acquire the perfect property that we were looking for. Her quality of services and assistance extends beyond the house search and purchase process and continues today. Debbie also helped us find a short term rental property and assisted us with the enrollment our two children in school and many other things. We without any hesitation strongly recommend Debbie to anyone looking for a truly outstanding realtor who places the satisfaction of her clients as her first priority. Debbie and Rod have made our purchase and sale experiences both positive and seamless. Selling and buying a new home can be stressful and chaotic, but we could not be more satisfied with the entire process. With a brand new baby at home most people said we were crazy to want to sell our current home and purchase a new one. But we knew what to expect when working with Debbie and Rod. We had previously purchased our first home with them and knew that they would make the process organized and as stress-free as possible! It’s evident that they always have our best interest at heart and are willing to go above and beyond to make us happy. Scheduling around a baby’s nap schedule is not always the easiest, but they took it in stride and had our house sold within days. They had a stager come into our home to take it to the next level, and it turned out absolutely gorgeous. Every detail of both the purchase and sale were taken care of, and they were always three steps ahead when it came to considering all of our new housing options. We absolutely love working with Debbie and Rod and have referred our stepdad and mom to them. They of course were thrilled with the sales of both of their homes and ultimately the purchase of their new home. When we’re ready to move again we know who we will be calling! I am writing to thank you for guiding me through the process of selling my Mom’s house, and for believing in the value of it. Wow – I can’t believe that it sold so quickly and for the price that it did.